The Eurocomach is an Italian brand which offers “European Construction Machinery” since 1992 and has decades of experience in innovation for the landscaping sector. All backhoe loaders, mini excavators (with short tail or zero tail), skid steer loaders, crawler excavators and chain dumpers of the Eurocomach brand are characterized by high, ISO 9001 certified quality both in planning and in production. We currently have two on our property, which can be taken home today! 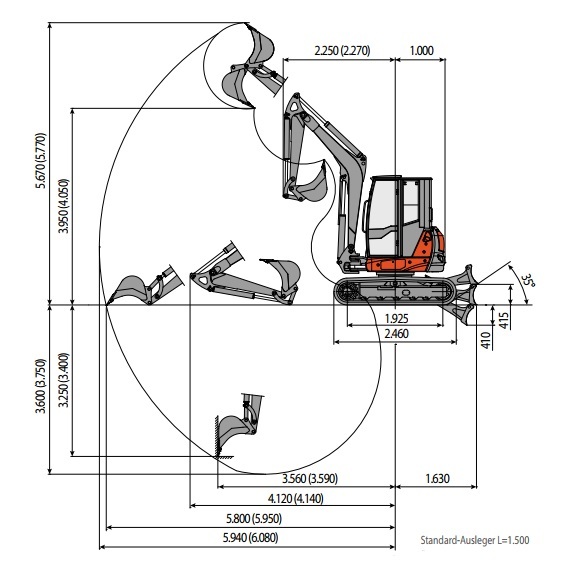 The excavator Eurocomach ES 60TR is a powerful all-rounder in its class as a mini excavator. With a range of spoons, grapples and hammers, as well as its compact design and with the ability to rotate 360 ​​° endlessly, it is versatile and can be used almost anywhere. This excavator is specially great for road and path construction as well as demolition or landscaping. 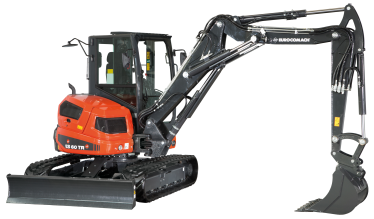 The Eurocomach ES 60TR mini-excavator with its 6-tonne weight is powered by a 46 HP 46-horsepower, four-cylinder Kubota engine with a fuel consumption of around 6 liters per hour and a fuel capacity of 75 liters. With a width of 1.98 m and a height of 2.56 m, it can dig up to 4 m deep. Its range is about 7 m. The hydraulics are based on a 65 liter hydraulic oil tank and a pump that can generate up to 260 bar working pressure. This means e.g. a maximum power on the bucket of 2,800 daN and a traction of 5,200 daN. All functions can be conveniently triggered and controlled by the ergonomically designed driver’s cabin using an on-board computer with multi tasking display and joysticks with hydroelectric and proportionally controlled commands.